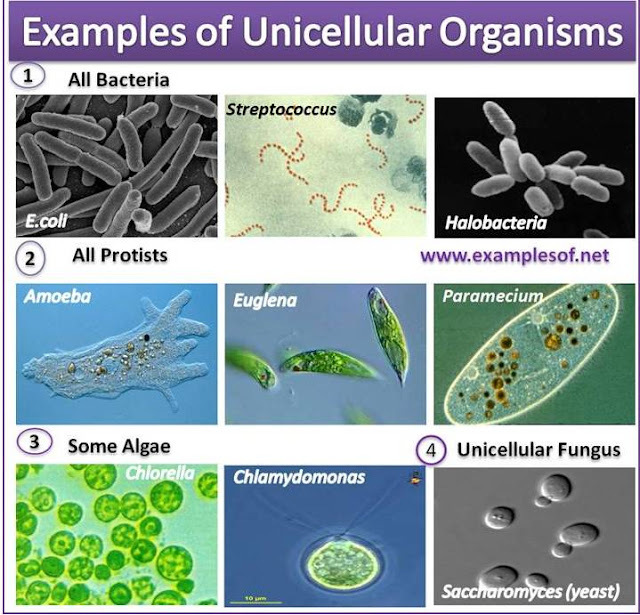 Unicellular organisms are organisms with a single cell. All characteristics of life like reproduction, locomotion etc is carried out by this single cell. Majority are microscopic. 1. All bacteria or prokaryotes are unicellularBacteria are prokaryotic organisms without a true nucleus. The genetic material DNA is not surrounded by a membrane as in eukaryotes. Membrane bound cell organelles are also absent. Reproduction is primarily by binary fission. 3. Unicellular algae: Algae are chlorophyll bearing thallophytes with autotrophic mode of nutrition. The thallus ranges from a single cell to very elaborate multicellular parenchymatous structure. Fungi are eukaryotic, non-chlorophyllated thallophytes with heterotrophic mode of nutrition. Majority are multicellular. Saccharomyces cerevisiae (Brewer's yeast) is an example of unicellular fungus.